LIFT SINGLE MAN 19 FOOT POWERLIFT PL60 Rentals Ft. Collins CO, Where to Rent LIFT SINGLE MAN 19 FOOT POWERLIFT PL60 in Ft. Collins, Wellington, Greeley, LaPorte, Loveland, Windsor CO and all of Northern Colorado. 25' working height. 350 lb. platform capacity. 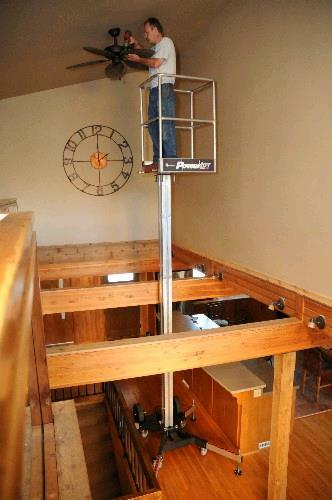 The PowerLift provides security and safety, while helping you gain access to difficult-to-reach indoor and outdoor spaces. 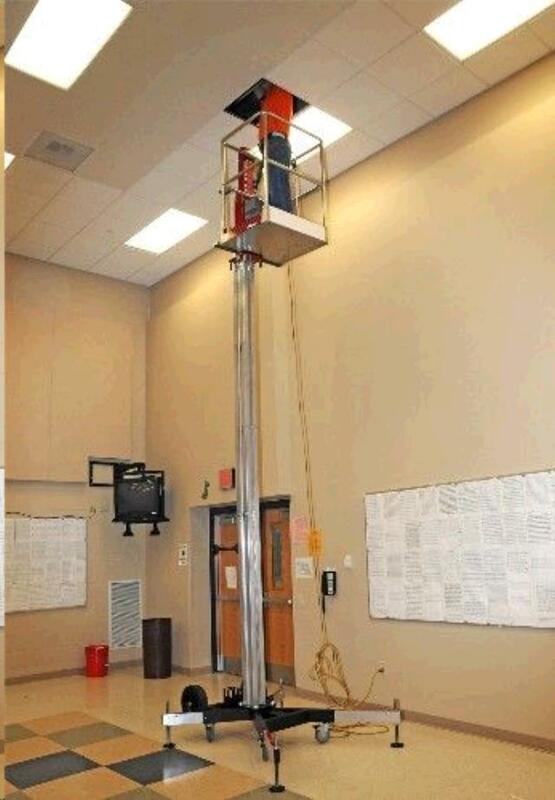 One person can easily move and operate this equipment up stairs or inclines. PowerLift is ideal for locations where access is difficult for other lifts such as stairways and tight spaces. It works great in factories, warehouses, offices and homes, both indoors or outdoors. The PowerTrak system lifts and lowers with a corded or cordless drill. No electronics or hydraulics to maintain. Fail-safe design includes emergency descent crank. The "tools-free" mast coupling is fast and safe. Transport wheels roll over the most challenging ground. 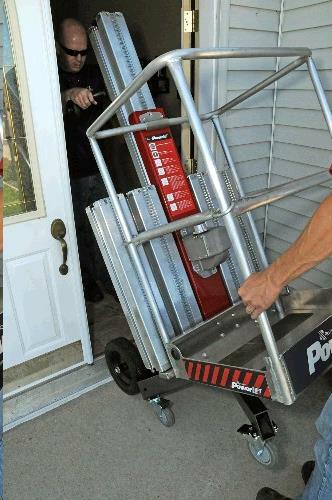 The Power Lift can be loaded into a pickup. Take off the Basket, Outriggers and the Mast sections for loading in a pickup. Stowed Length 53.4" Width 30", Height 69"
Outrigger Footprint Width 67.1" , Length 64.4"
Distance from Wall Side 18.5" , Wall Front 10.3"
Platform Size (L x W) 26" X 30"
* Please call us for any questions on our lift single man 19 foot powerlift pl60 rentals in Fort Collins, Wellington, Greeley, LaPorte, Loveland, Windsor CO and all of Northern Colorado.